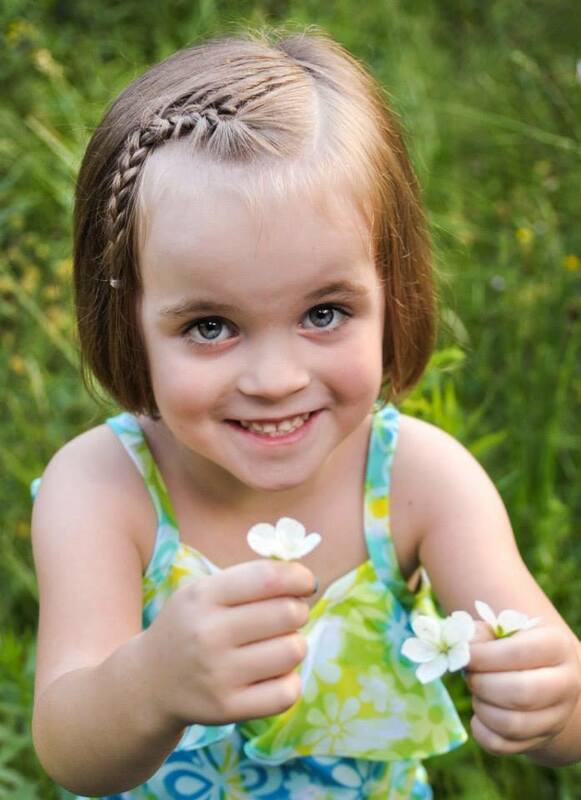 I cannot believe my Beth is in Kindergarten! She started last week and so far can't get enough of it! She was totally bummed when I told her it was the weekend. They really do grow up too fast. Here are a few shots from her first day. Its done! What do you think? I'm redoing my pictures walls, again. I've had the decorator bug lately, so I've been working on things slowly. Here are the latest changes, they are not perfectly finished yet, still a couple of things to add to the main living room wall. But so far I'm LOVING it! Before the Kate adventure started we were enjoying a great time with our great friends Natalie, Michael and Mckinsley at their Cabin. I got a few pictures of the fun before everything fell apart! James is still asking why we didn't get to finish shooting arrows. He LOVED it! He was getting pretty good too! 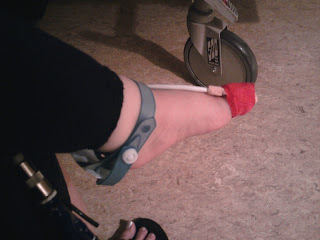 She thought daddy needed some co-ban on his foot too. It was adorable. It all started Saturday morning. Kate woke up, cheerful and normal. We packed up the kids to head up to Park City to meet up with our awesome neighbors, the Ericson's, who had invited us up to their cabin for the weekend. Kate fell asleep on the drive and all seemed well. 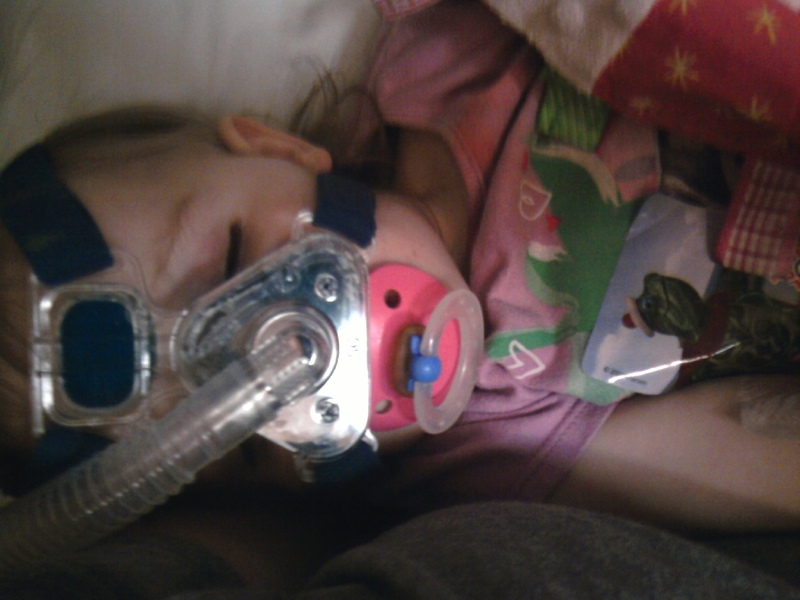 When she woke up she starting coughing a little bit, something that is pretty normal for her since her case of RSV in the Spring. It seemed to get worse through lunch and the drive to the cabin, but I wasn't very concerned yet. Once we got there, she was playing and cheerful, if a little tired and wheezy. 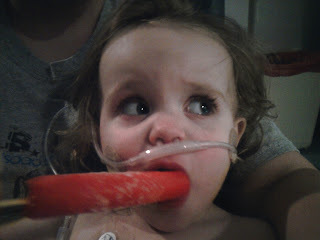 We gave her a puff of her inhaler we've had since RSV as a precaution and went about our day. She got wheezier and wheezier as the afternoon went on, so we used her inhaler again and put her down for a nap. By the time she woke up, her breathing was extremely labored. She was breathing super fast, she wouldn't eat or drink and she sounded horrible. I knew at that point she needed a breathing treatment (I'm an asthmatic, for those of you who don't know, so I felt like I knew exactly what was going on with her). So Ryan and Michael put her in the car to head to the Heber hospital, a good 30 minutes away. Of course this had to happen the ONE day this year we didn't sleep at home. By the time they got there she was hysterical and extremely labored. 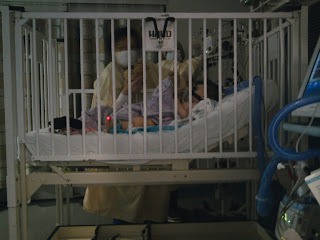 Her oxygen saturation was in the low 60's and her respiration rate was around 75. Both of those are horrible! They gave her 2 breathing treatments, which helped the wheezing a bit, but she was still working super hard. 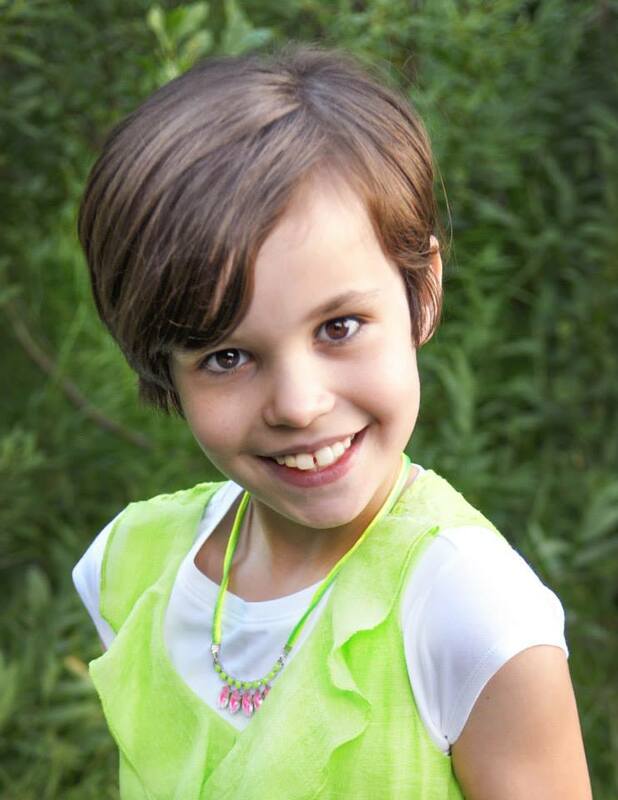 The Heber hospital decided they were not equipped to handle a possible respiratory arrest, which they felt could be eminent with her current situation, and decided she had to be life-flighted to Primary Children's Medical Center. Ryan called me and told me the situation. We were both totally freaked out, of course, and we didn't know what to do. I was at the cabin 30 minutes away, and we didn't want to leave her alone, so Michael drove back to get me, then drove his car back to the hospital again so I could follow him, since it was the middle of the night at this point and I had no idea where I was going. I had thrown the sleeping kids and all our stuff in the van as quickly as possible. 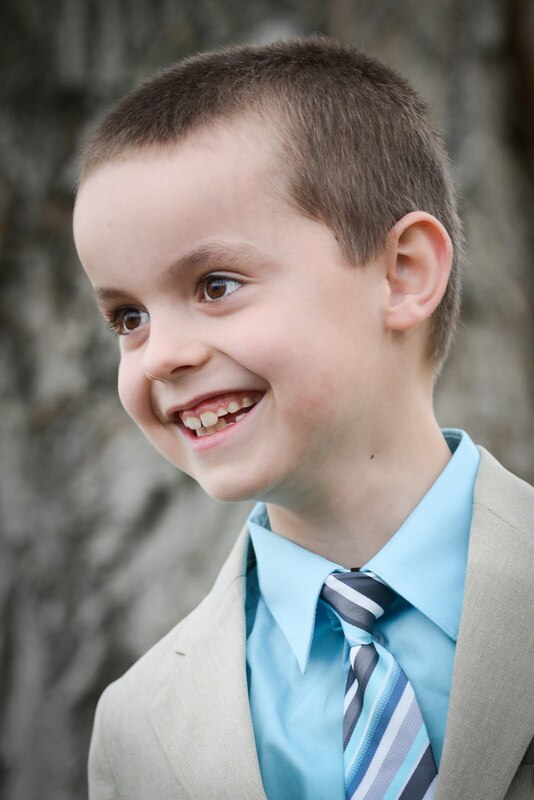 By the time I got there, life flight had left with Kate and she was already at Primary's. I was very distraught that she was alone, struggling to breath about an hour away from me. It was an awful feeling. We drove as quickly as we could to get there and Ryan dropped me off and went home to put the big kids to bed. 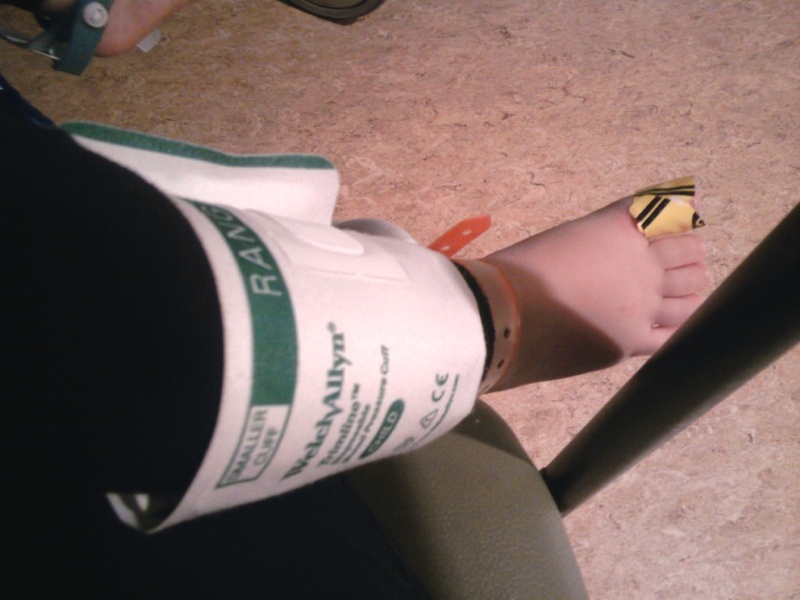 I ran in and found her in the ER, and this is what I found, well, minus the sleeping. Just about the saddest sight I have ever seen. 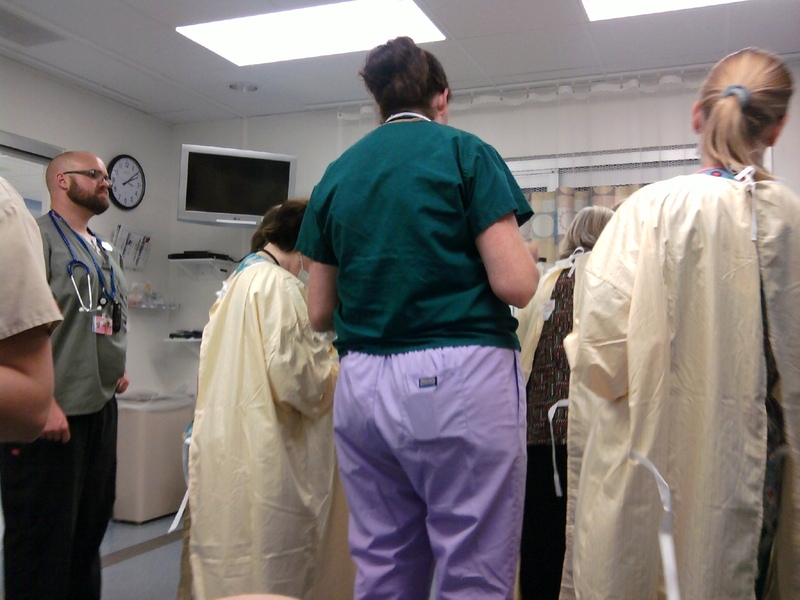 She was on a CPAP machine, delivering pressurized oxygen to her lungs to expand them. They said she got there just in time to avoid intubation. She HATED that contraption on her head, but it started to help calm down her breathing. She also had a pulse oximeter, a three different leads monitoring her heart and breathing, and an IV for fluids and antibiotics. 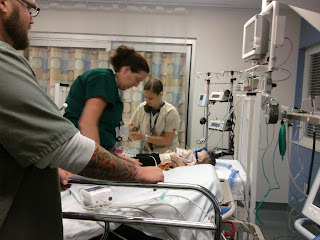 We were in the ER for an hour or so more while they watched her and got all of her levels just right then she was moved to the PICU. 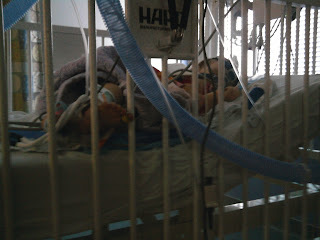 Our time in the PICU was spent fighting the CPAP, rocking, untangling chords and wires, and attempting to get sleep. Notice I say attempting. The first night I slept about 30 minutes, and the second night, maybe 4 hours if I give a conservative guess. 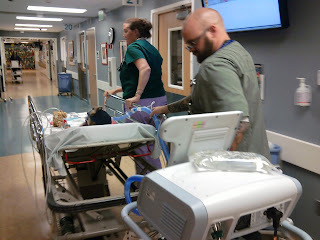 We spent Saturday night, Sunday and Monday morning in the PICU, I traded off with Ryan back and forth the whole time. 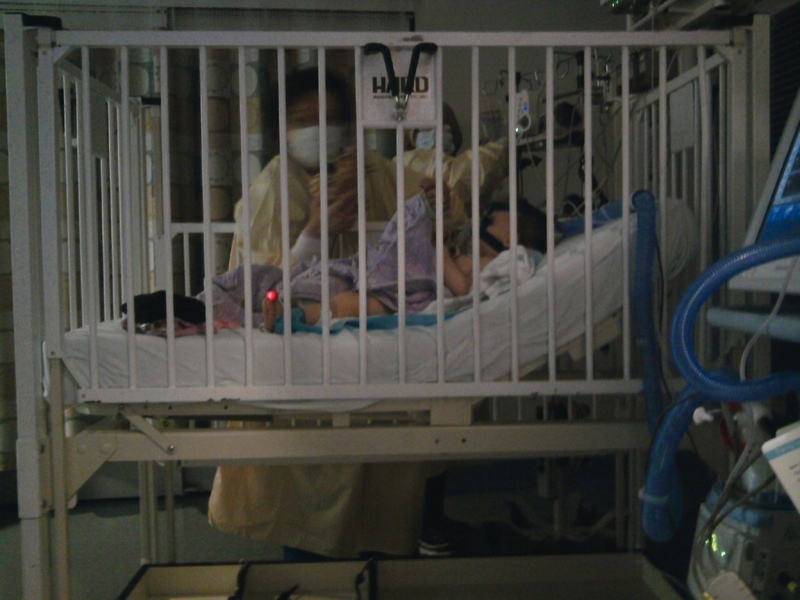 They had to turn her up to BiPAP at one point, and then slowly weaned her oxygen needs down until the could put her on High Flow oxygen, through a nasal canula, but still pressurized, then finally to regular oxygen through a canula. 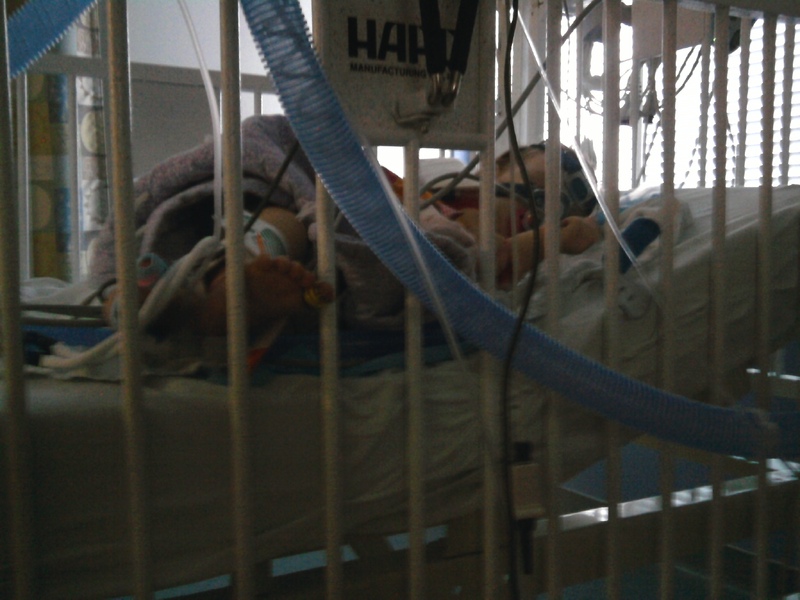 She also got a breathing treatment every 2-4 hours, plus other vitals checks and lots of stethoscopes to her lungs, and 3 chest x-rays. It was insanity. And, she wasn't able to eat until Sunday night, when she finally got to have a popsicle. That was the first smile we saw in 24 hours! Once she was stable on regular oxygen, they were able to move her out of PICU to a regular room. That happened Monday morning. 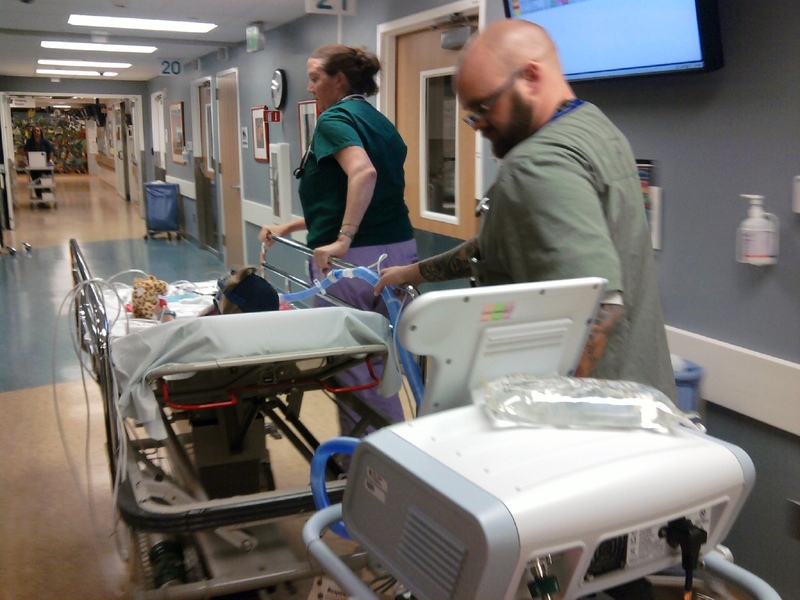 We were relieved to get her our of the ICU, but things were difficult in the regular room because Kate was feeling a bunch better and did not understand why she was still completely tethered within a 2 foot radius. She was very grumpy and restless. 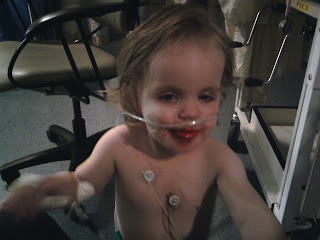 Finally this morning (Tuesday) they let her off of all of her chords and she was able to roam around in the room. That helped cheer her up a little, we finally got to see a peak at our happy child again, but it was still a battle until we were discharged around 3 in the afternoon. She came home on a preventative asthma medication, an asthma inhaler, an antibiotic and a steroid. 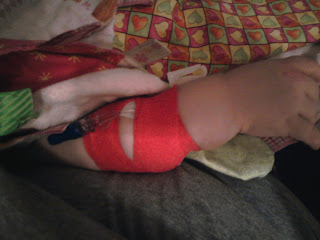 She was thrilled to leave the hospital but has had a very difficult evening. Probably because she is soooooo tired! This past weekend was the annual Larson Cup triathlon! I look forward to it every year. I really do. Sometimes I wonder why, especially when the nerves kick in, and then the exhaustion after its all over, but its one of my favorite things that happens every year. I'm so proud of my family for keeping it going! I think there were about 15 of us that participated this year, plus lots more that were there as cheering sections. I have been trying to train for the past 4 months or so as part of my on going battle with my weight and trying to get in shape. I wasn't nearly as ready as I wanted to be, but I was determined to finish the whole thing for my second time ever. My next door neighbor Natalie has been training with me and I talked her into participating too. I really don't think I would have trained as well without her, and its always great to know you have someone there with you. I'm so happy she came! The Monday before the race I came down with a horrendous cold. Perfect timing. I was really annoyed that all of my training would go to waste, but I was still determined to do my best. I finished the race, at a personal best time of 1:59.30. Its not nearly what I was hoping for with the amount of training I put in, but it was still better than my first time (2:08.45), and I finished, so I'm happy! The course was really tough, there was a KILLER hill that we had to traverse 5 times! And the fact that I was exhausted from not sleeping well from my cold, and not being able to breathe probably contributed to my slowness. 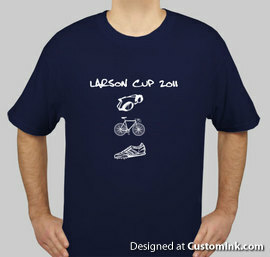 :) Its given me the bug for triathlons though. I'm helping a few girls in my neighborhood train for one and I think I will do one more this year, and keep striving for my goal of finally winning the women's division of the Larson Cup! Unfortunately I don't think I lost more than a pound or two for all my effort, but I'm gonna claim I have more muscle now. Or at least I hope so! I forgot to bring my camera, but several family members had one and took pictures. Unfortunately, so far it seems that no one got any pictures of me participating! So I have no physical evidence of my participation, besides sore muscle, but I think my family will vouch for me.